DARMSTADT, Germany — Europe’s second polar-orbiting meteorological satellite, Metop-B, was successfully placed into orbit Sept. 17 by a Soyuz rocket operating from Russia’s Baikonur Cosmodrome in Kazakhstan. Officials at the European Space Agency’s Esoc space operations center here, which has responsibility for Metop-B’s postlaunch operations phase, confirmed that ground stations had received a signal that the satellite was healthy in orbit. The 4,082-kilogram satellite, carrying 11 observing instruments from Europe, the United States, Canada and France, will operate in an 820-kilometer polar low Earth orbit. After six months of in-orbit tests, it will monitor weather conditions in tandem with the nearly identical Metop-A launched in October 2006. Metop-A continues to operate with all instruments functioning despite having been in service for nearly a year longer than its contractual design life of five years. Metop-B had been removed from storage and prepared for a June launch that was canceled because of a dispute between Russia and Kazakhstan about compensation for rocket debris falling on Kazakh soil during Soyuz liftoffs into polar orbit. Alain Ratier, director-general of Eumetsat, Europe’s 26-nation meteorological satellite organization, said the four-month delay has cost Eumetsat more than 10 million euros ($12.5 million). During a press briefing at Eumetsat headquarters here, Ratier said Eumetsat and industry are still negotiating who will pay these costs. 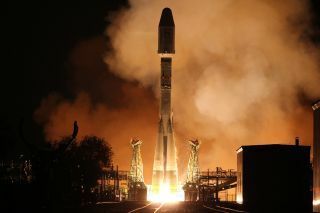 In commercial launch contracts of this type, it is customary that the launch-service provider, in this case the French-Russian Starsem joint venture, not be held liable for the costs of delays. The entire Metop program — the three satellites, their launches and the related ground infrastructure — cost 3.2 billion euros when adjusted for inflation at 2011 economic conditions. Eumetsat paid 75 percent of this, in keeping with the organization’s long-established relationship with the 19-nation European Space Agency (ESA). ESA finances the design and procurement of the Eumetsat satellites. In the case of Metop, ESA is also paying for the development of three of the satellites’ observing instruments. The U.S. National Oceanic and Atmospheric Administration (NOAA), as part of a joint U.S.-European partnership in polar-orbiting meteorological satellites, is furnishing four instruments. Eutemsat is contributing to NOAA’s polar-orbiting satellites in return. ESA is preparing to ask its member governments in November to approve funding to begin work on the second-generation Metop satellites. ESA Director-General Jean-Jacques Dordain said in a briefing here before the launch that the agency will seek 800 million euros in Metop Second Generation funding in November. The first launch would be in 2020. Dordain said that even in a time of economic hardship for many ESA member governments, there is a consensus on the necessity of maintaining the meteorological satellite program. Ratier said Eumetsat has received authorization to proceed with early work on the Metop Second Generation system despite the fact that it has not received 100 percent of the needed funding. Several cash-strapped Eumetsat members — Spain, Ireland, Portugal and Greece among them — had been unable to commit to the program until recently. Ratier said Eumetsat has received 98 percent of what it needs to begin its Metop Second Generation studies following funding commitments from Spain, Ireland and Portugal. ESA is also asking its governments for 1.6 billion euros over four years to fund experimental Earth observation satellites in ESA’s Explorer series. Finding support for this program has proved difficult, and ESA officials are now talking about scaling back the program to secure support for it.